See what some of our clients, past and current, are saying! Karim Nensi, CFO of Stephenson’s Rental Services Inc.
Barbara and her staff were very helpful and responsive to all our questions and concerns. Our home was a difficult one as it caught fire during construction but we got through it with the support of her team. Overall, it was a pleasant experience and we would use her again. A great boutique law firm in Burlington. Used Frederikse Law for a recent real estate transaction. They were efficient, delivered on time and priced fairly. I would recommend to family and friends with complete confidence. 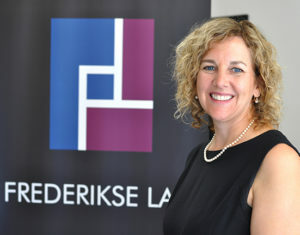 Frederikse Law completed my house purchase/mortgage and sale transactions with ease. It was a pleasure dealing with both Barbara and Vanessa. They made the process very easy and stress free. Thank you. Barbara Frederikse has handled our home refinancing and the purchase and sale of our new/old homes. Barb and her staff are reliable and a pleasure to deal with. You get Bay Street service without paying Bay Street prices. Vanessa and Barbara are always a pleasure to deal with. They have always provided me with proper guidance in my legal matters. They are both knowledgeable in their own areas and are always happy to help! We’ve used Frederikse Law twice; in the real estate transaction of selling a house, and then to add my partner to the deed of my home; the whole experience was seamless! Barbara and Vanessa were great! They are very organized, prompt, and able to answer all my questions. A few months ago I was looking around places to get some real estate legal advice, my friend told me to go speak with someone at Frederikse Law in Burlington. I was going in there not knowing anything I just needed some guidance. I spoke with Vanessa she was so friendly and really made me feel comfortable. She really took the time to explain everything to me to make sure i understood everything. She was so helpful and so kind! I will forsure be going back if I ever need help! And most of all I will definitely be recommending Frederikse Law to my friends and family who are looking to speak with someone for advice! Barbara and Vanessa are so knowledgeable, helpful and friendly. I had my Will and Powers of Attorney updated by Frederikse Law just recently. Barbara took the time to explain all the details and learn about my family before suggesting the right approach. I would recommend Frederikse Law for real estate, business and wills and powers of attorney for their outstanding personal service. I dealt with the team at Frederikse Law for my most recent house purchase. I must say that they are great to work with! They are very professional, they don't rush you and they respond to email and phone calls promptly. This is the first time that I used this law firm and I will definitely go back to them again when needed. I would highly recommend Frederikse Law. I recently used this firm to handle the handle the legal side of the sale of my old home and purchase of my new home. The service was honestly FANTASTIC! I have purchased and sold homes in the past and I must admit that the level of professionalism and service was far beyond my expectations! The attention to detail, the dedication to meet deadlines (my sale was complex), and the level of service was outstanding! I have and would recommend this firm to anyone in need of legal services! (and their fees were competitive and reasonable) I would use Frederikse Law again without a doubt!